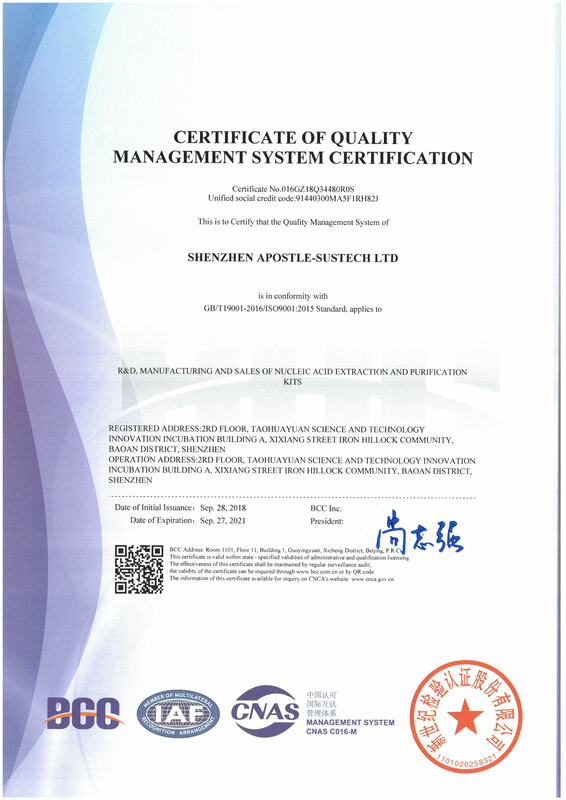 MENLO PARK, CA, USA; Shenzhen, China, September 28, 2018 – Apostle Inc is pleased to have been awarded ISO 9001 certification for our R&D, Manufacturing and Sales of Nucleic Acid Extraction and Purification Kits in our manufacturing facility located in Shenzhen, China. This certificate demonstrates our commitment to providing a high-quality and consistent service to our clients and our ongoing investment in technology, development, processes and procedures. Apostle Inc is a biotechnology company in Menlo Park, CA. It’s in the business of the research, development, licensing, and sales of novel technologies, and the related intellectual properties, products, and services for diagnosis and treatment of human diseases, to fundamentally improve the accuracy and efficiency of liquid biopsy - the testing of circulating free DNA (cfDNA) - in early cancer detection or other clinical applications such as noninvasive prenatal testing (NIPT), tests for infectious diseases, therapeutics including CAR-T.